It turns out a good way to get stared at is to drag your kayak briefly through part of a park before launching it into a lake, and then be a girl fishing by yourself. Wednesday I was called off at work. The day started cool and cloudy, and eventually a small thunderstorm cell ripped through part of town, dropping hail. 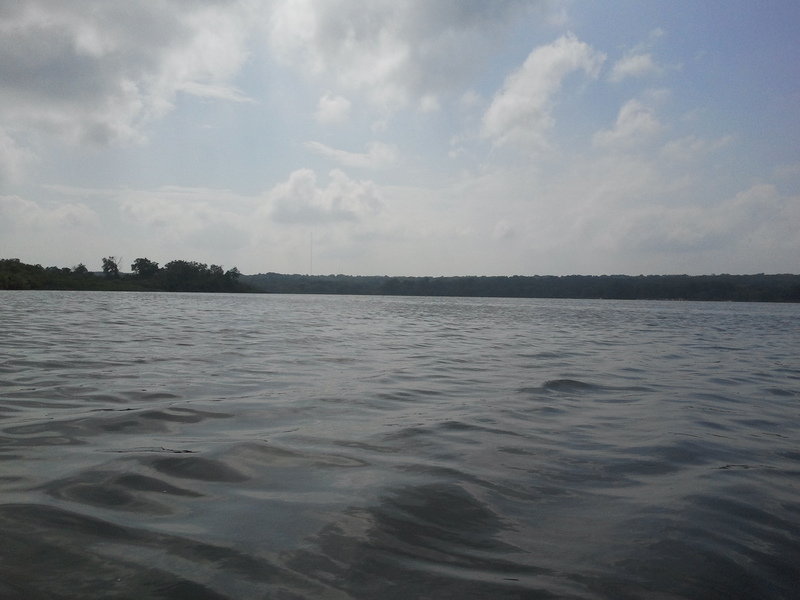 After the thunderstorm passed, I packed up the kayak and my gear, and headed to Lake Wingra for some panfish. Getting there from my side of town is always fun, with the oddball streets and 5-way + intersections on the isthmus, but we’d fished here before with good results. 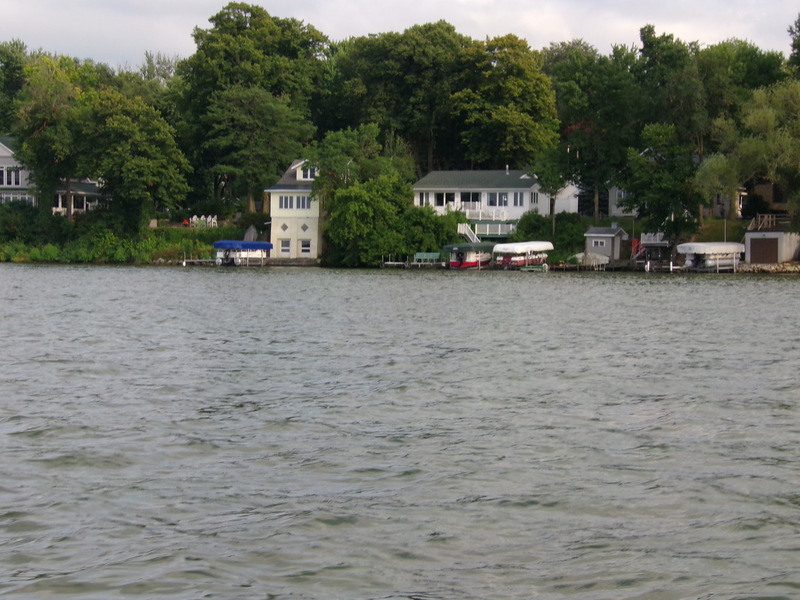 On top of that, this lake is also bordered by Madison’s small zoo. From my fishing spots, I could hear a rooster crowing and the lions roaring. 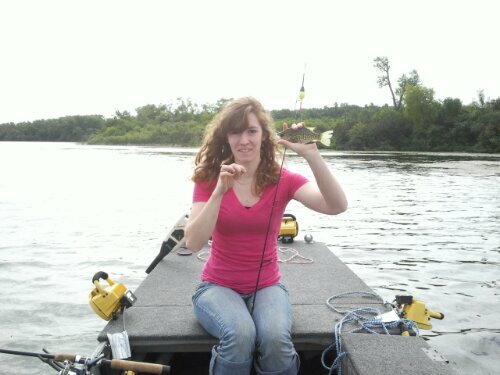 I wasn’t necessarily looking for lunkers- I just wanted to catch something. And did I ever accomplish that. 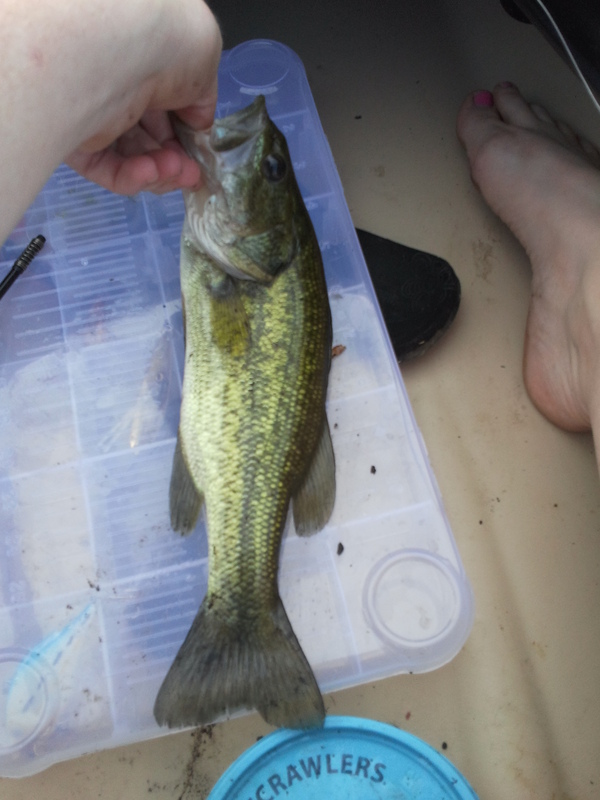 My first bass, a 12.5 incher, within 5 minutes of my first anchoring. All in all, I would catch 15 bluegill and lose easily another ten, which would have made for a day limit for one person. 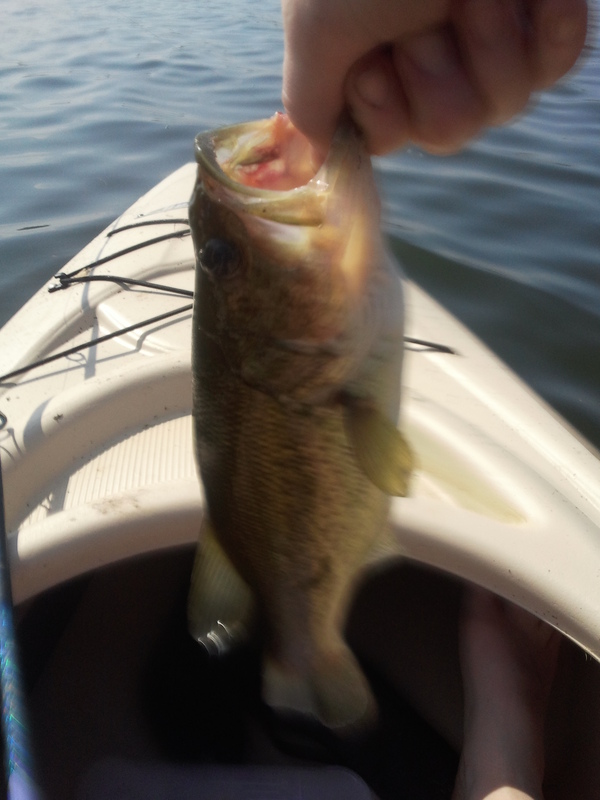 I caught a third bass, but didn’t get a picture. None of the bass were big enough to keep. 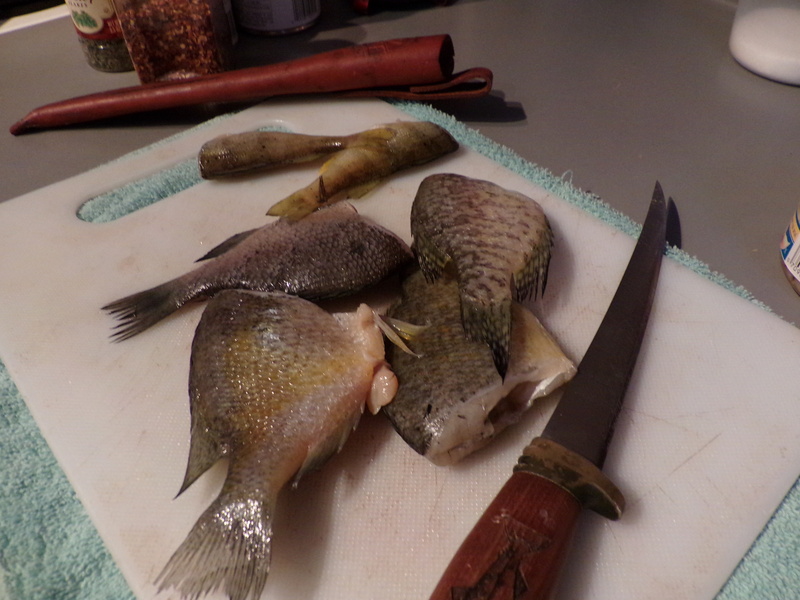 I could have held on to some of the bluegills, but I didn’t want to fillet little 6 inch fish, and literally all of the ones I got in the kayak were 6 inches. I also forgot a stringer or basket for them. Even starting my fishing trip well before dusk, the fish where biting extremely well. I made it around the lake in about three and a half hours, and then got everything back in the car and headed home. 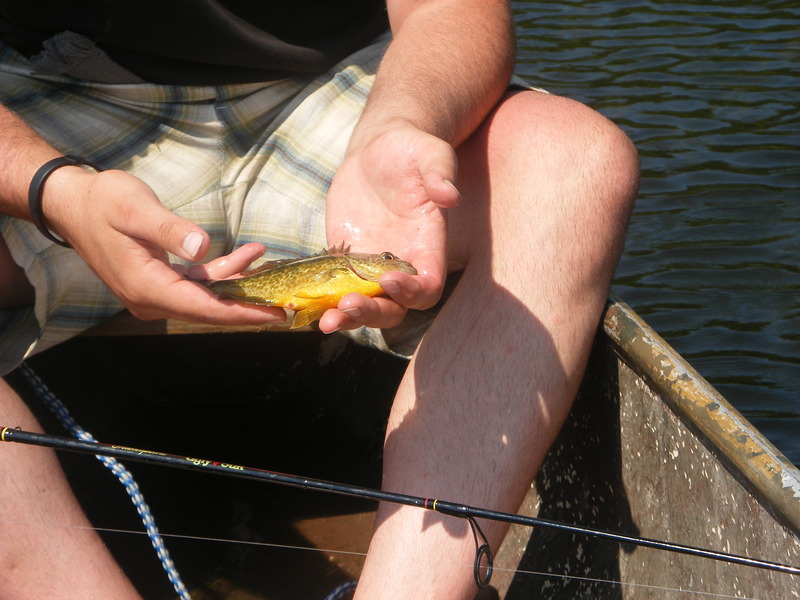 Sunday marked the end of the season for everything but catfish and panfish. We made it out on Saturday for a few hours, but between forgetting the Marcum and not being able to figure out where the drop off was, we called it early. It was in the single digits, windy, and snowing. To top it off, our luck on Lake Mendota is always abysmal. That said, dragging a loaded sled a mile and a half across a frozen lake and back in powdery snow is one hell of a leg workout. Super tired of looking out the front window and seeing this. At the rate the weather is going, we’re going to have decent ice through mid-March. Honestly, it would not surprise me one bit if I was still able to walk on in early April. 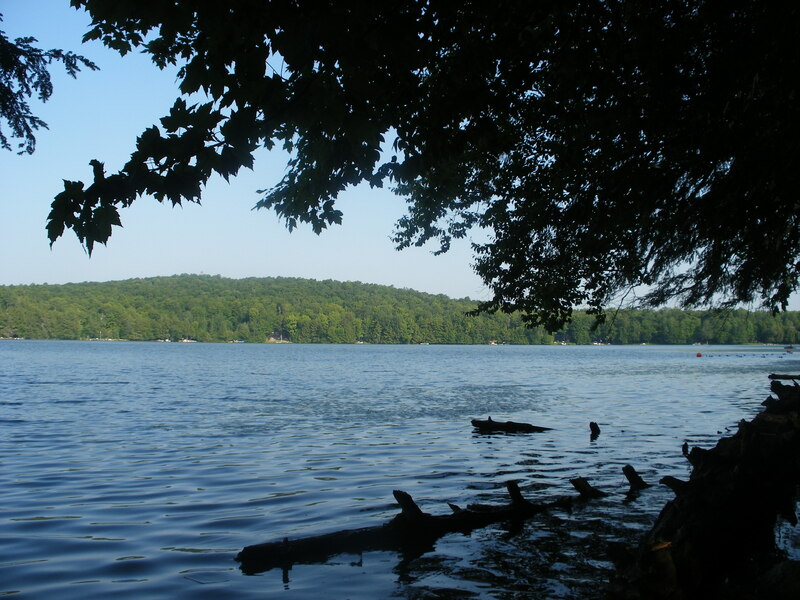 If we have a cold, long Spring again, the lakes may not be ice-free until mid or late April. Honestly, I’m ready to just be able to see dirt and grass again, even if it’s dormant and brown. I need to till for my garden, I need to get in the back yard and clean up the dog poo that’s accrued since my last scooping back in December, and there’s a bunch of stuff we’d like to get done both on Ditch Boat and in the garage- there’s still deer legs and skins and bits and pieces hanging around from November, as well as a dead coyote yet to be skinned. The coyote is its own funny story, though. But none of that is going to get done as long as the temperature is below 15 degrees. Luckily, it’s looking like we’ll peek over freezing by late this week. 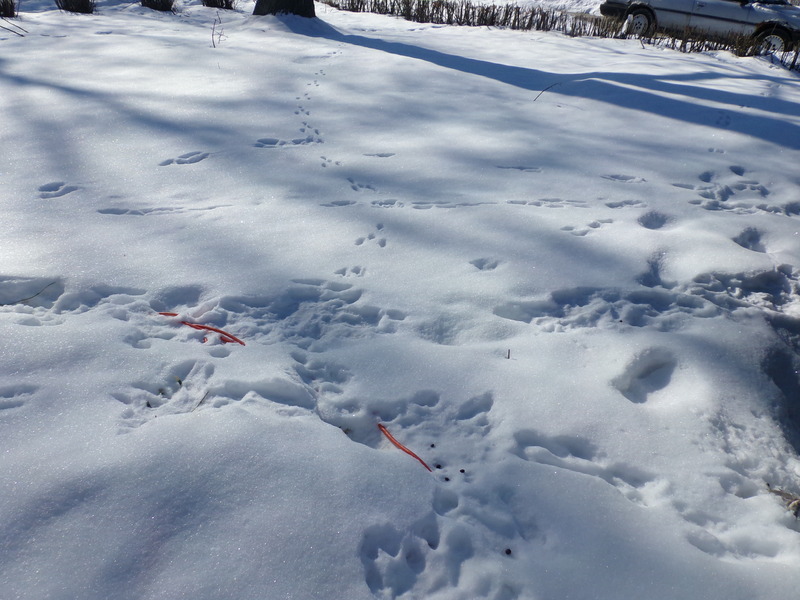 Bunny and squirrel tracks in the snow. So, we’ll have to wait until early May to get back after muskie, pike, and bass. Early trout opened this weekend, but it’s catch and release. Luckily, this year we were forward thinking enough to put in for our turkey tags early and pick an earlier time. My tags start on the 16th of April, which is the second week of the season. I got Matt his permit at the same time, but I can’t remember whether his is for the week before or the week after mine, and I can’t look his info up for him. Anyway, his are for up on his grandad’s farm, where we saw the flock of toms and jakes last summer, and mine are for down here in the Madison area. I’ll try to get that tom out at Sunny Slope again. 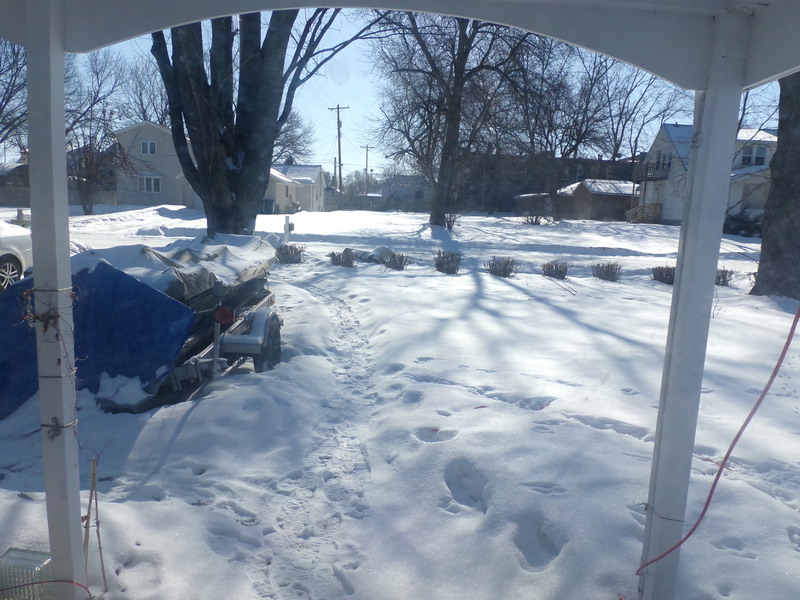 So the plan right now is to wish as hard as we can for Spring, and try to get some stuff in order until then. It’s been Winter since mid-Autumn and I’m ready to see it go. One of the best parts of catching crappie is the spelling of the name. 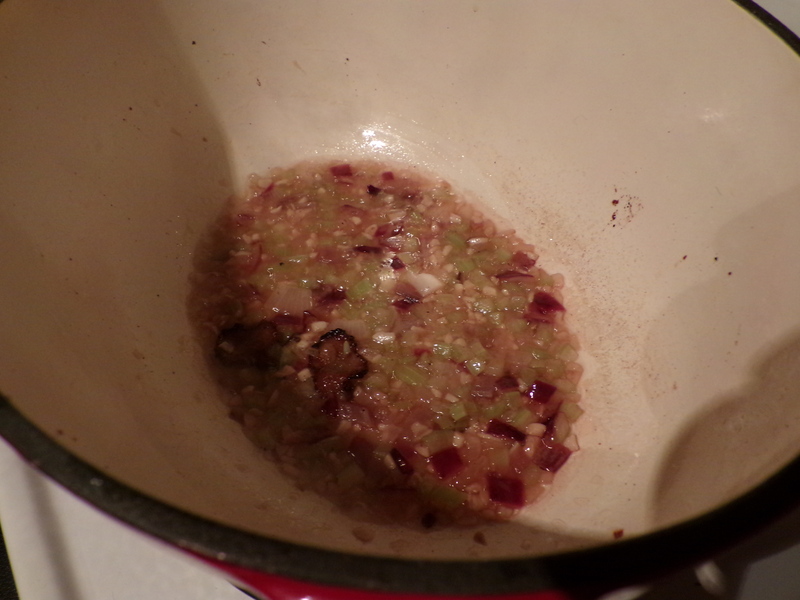 After our catch on Saturday, I had a a couple crappie dishes to share with you (Crappie Miso soup, anyone?). 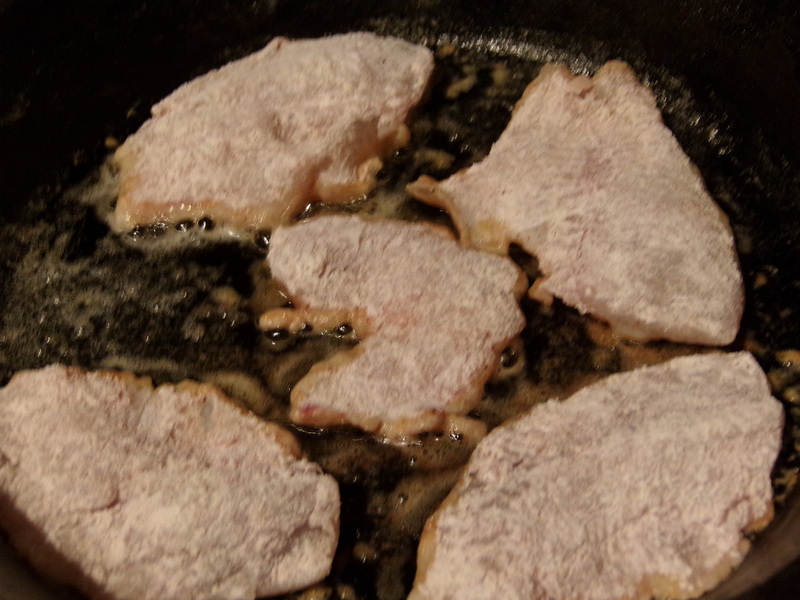 These were dinner on Sunday night. 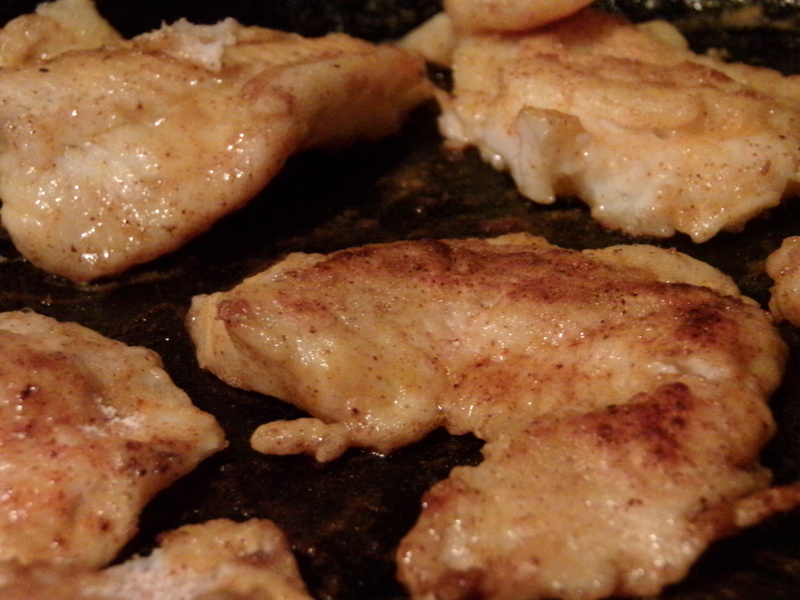 After filleting them, I spritzed them with some lime, dredged them in flour mixed with some cumin, paprika, and chili powder, and fried them in a hot cast iron pan. 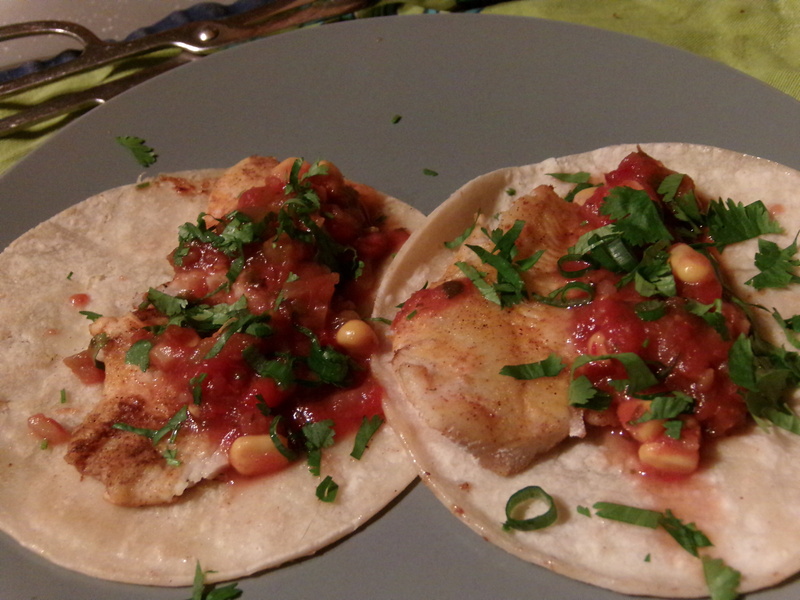 They were served with some salsa and fresh cilantro and scallions on warm tortillas. Pretty damn tasty, pretty damn fast. One Last Summer Fling Before Fall and Life Catch Us Up. Normally, my new posts go out on Mondays. But we got back from this vacation on a Thursday. I’m also working all through the weekend- closing the dining room tonight, and closing the bar on Saturday and Sunday. Those two days I also arrive at work by 11 am. They’ll both be long days. I’m not too sure how much I’ll have to write about come Monday, but I had an idea. You see a lot of how-to for packing for camping. 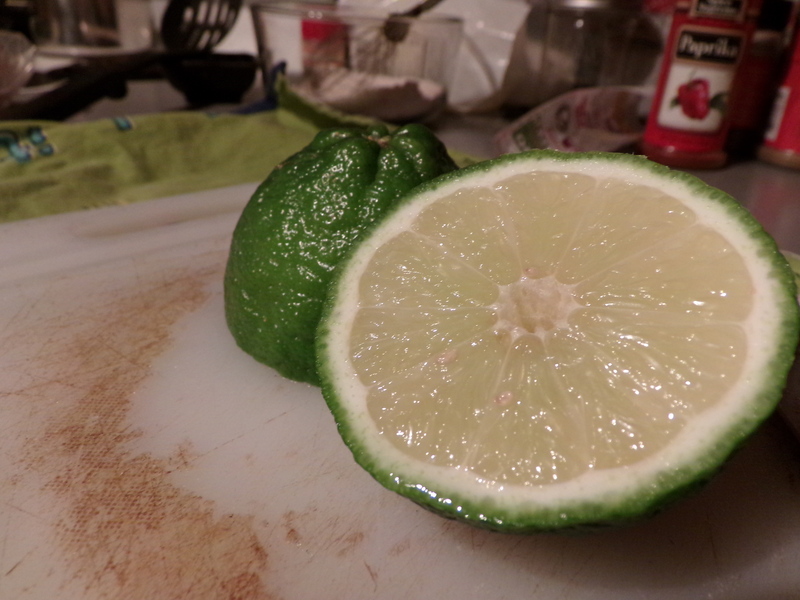 I took some pictures of my get home, get unpacked process. Anyhow. Last Monday I wrote about the salmon fishing we did last week Saturday. We stayed that night in the Appleton area with Matt’s brother and his wife. Sunday morning we hooked the camper back up, packed up the pups, and headed further north. We stopped at a little grocery store in a town along the way to stock up on food. It was a very pleasant ride all along country roads on a sunny day. Farmers were haying, and that far north, we were seeing the outermost leaves on the ash and maple trees beginning to change color- in spite of temps in the 80s and up. Light filtering through the pines. At the hardware store in town. Our little site on the lake. For the most part, we spent the week fishing. This was another National Forest campground- Richardson Lake. We camped here once last year in June, before I ever started this blog thing up. It was rainy and chilly the entire time, and we were stuck in a tent. 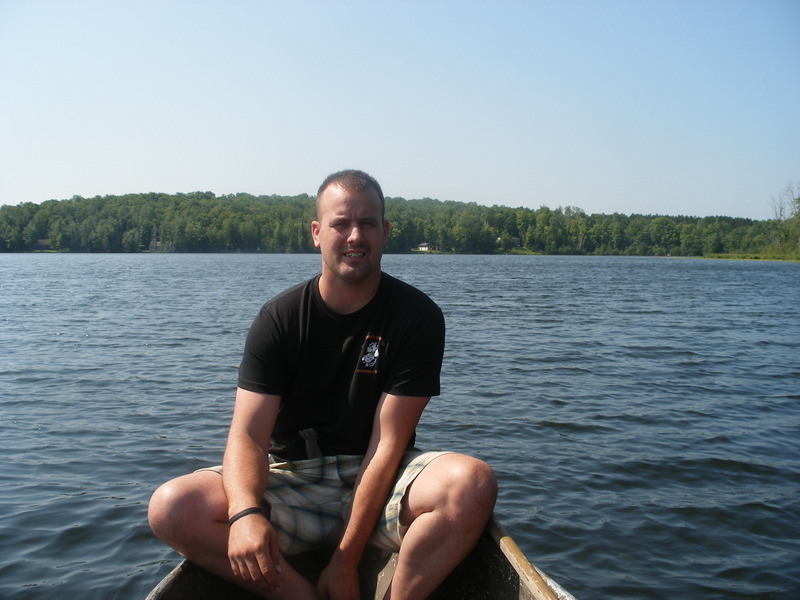 At the time, the jon boat had only one trolling motor on a too-small battery, and the old Merc didn’t work. We also didn’t catch any fish. Not so this time. We had the camper and the canoe. It was nice and warm most of the week. And were the fish ever biting. I didn’t get as many pictures as I would have liked, as my phone and only camera blew through its battery fairly quickly. I need to remember to turn off mobile data that far in the stix so it isn’t constantly searching for a signal. The end total of 32 panfish- bluegill, black crappie, perch, and pumpkinseed. We fished mostly there on Richardson, but one day we did go to a different lake, where Matt’s grandparents live. That’s where we caught the big pumpkinseed and the big bass. When we weren’t fishing, we were visiting Matt’s family and tooling around the area. One thing I wish I’d gotten pictures of, but wisely did not take my phone/camera for was a trout fishing attempt. 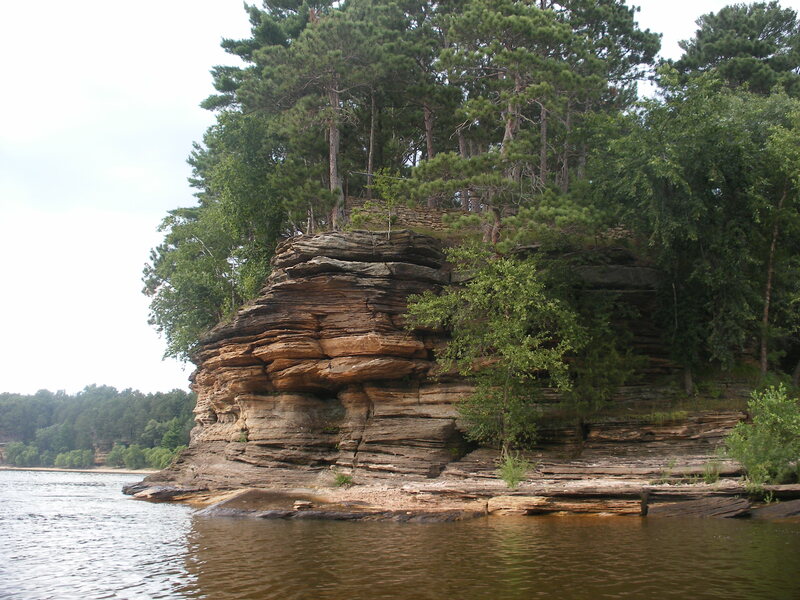 The Oconto river near Matt’s hometown is cold and rocky. It holds brook and brown trout. One of his old high school buddies took us down there for trout. 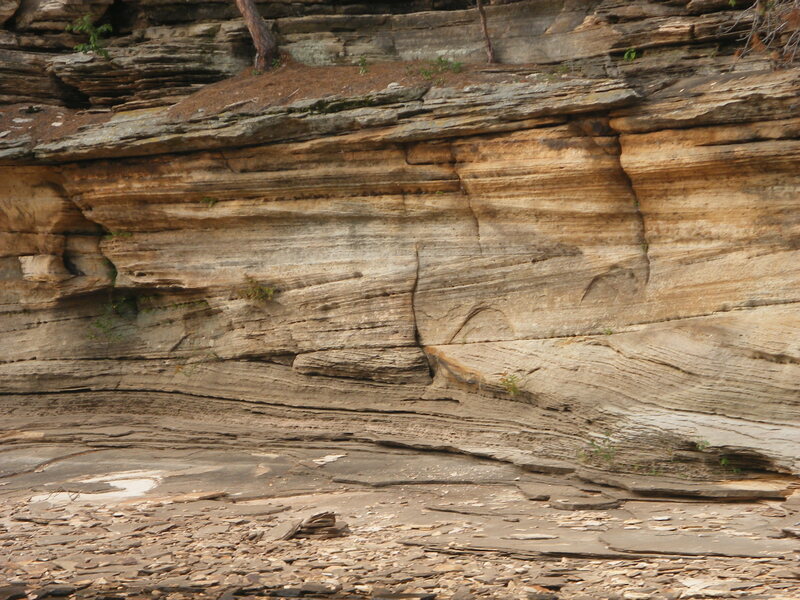 It was rugged and beautiful. When we picked his buddy up, we should have known we were in for trouble. 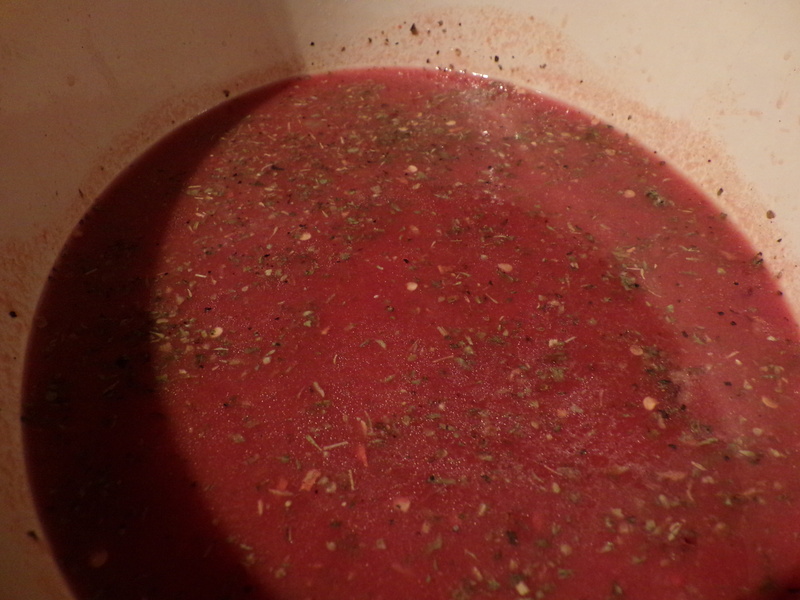 On the phone, he specifically requested Mike’s Hard Black Raspberry Lemonade and jalapeno beef sticks. He said without those, there would be no trout. He was waiting in his driveway in a pair of chest waders. Matt and I were in shorts and sandals. We went offroad in the Durango for a couple miles, and then bushwhacked our way down to the water. When I said rocky, I meant bouldery. And loggy. When logging was still a big thing in northern Wisconsin, they’d floated logs down the river, and you can still see some of the bigger ones. The rest are all deadfalls. We spent two or three hours scrambling over rocks, under trees, and through icy water. Matt dunked himself repeatedly. I didn’t go in over my knees until the last minute, soaking my right side. No trout, only chubs and smashed, tender feet. Other than fishing, we did some shooting. I got in some practice with my bow and got it sighted in. We also did some trap shooting, and I got more practice with my shotgun. Based on my practice, the ducks and geese have quite the upper hand this year. We also went coyote hunting on his grandfather’s farm. The first morning we didn’t see anything. But we went our last night there (Wednesday). It turned into a bit of scouting. We saw at least 5 deer. 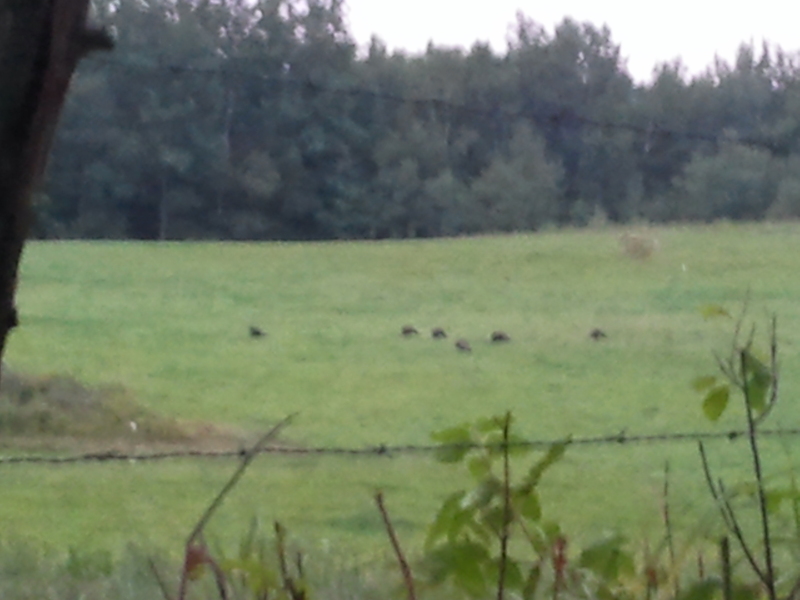 We also saw a flock of turkeys. Three toms, three jakes. We didn’t see any coyotes, but they did answer our calls in the distance. 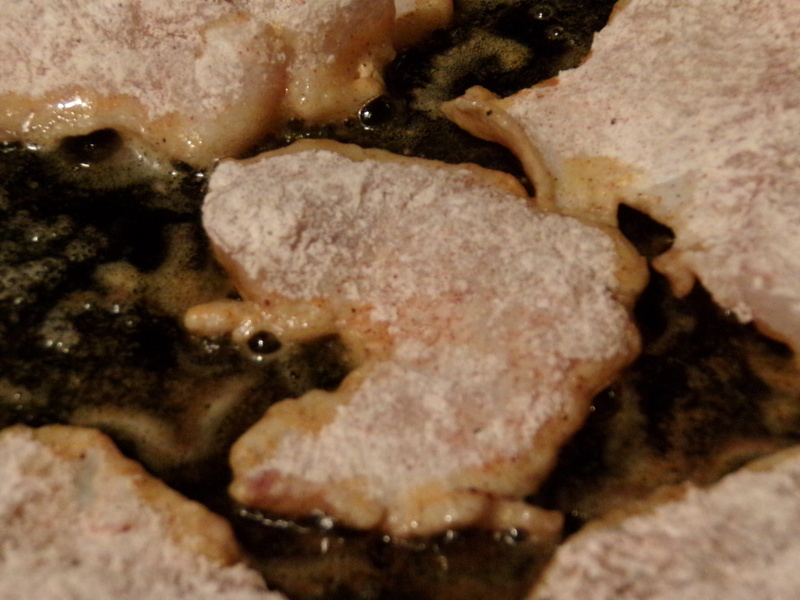 Blurry turkey blobs. I need a new camera. 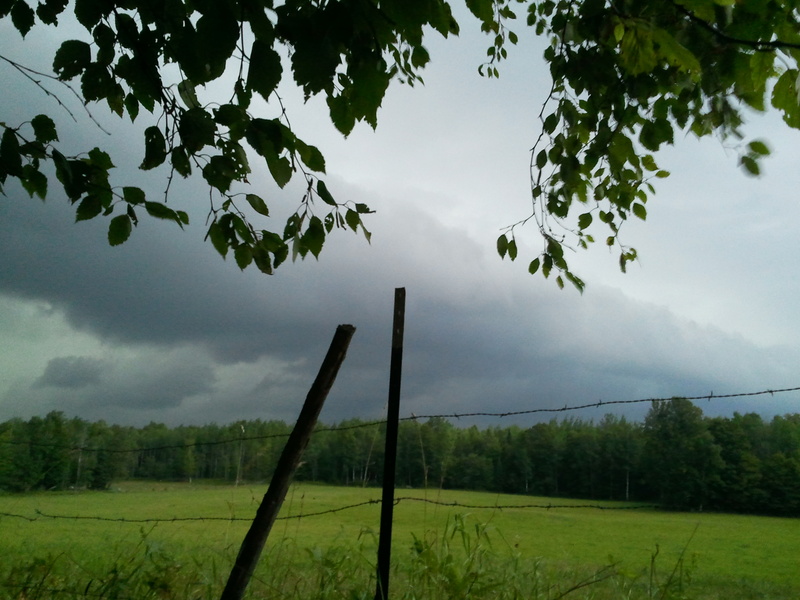 However, we started to hear thunder rumbling. On the way over, we’d caught some weather advisories out of Marquette, Michigan and Marinette. We hoped it would pass north of us, but then the thunder got louder and this happened. It poured. We got soaked. The deer got soaked. The turkeys got soaked. 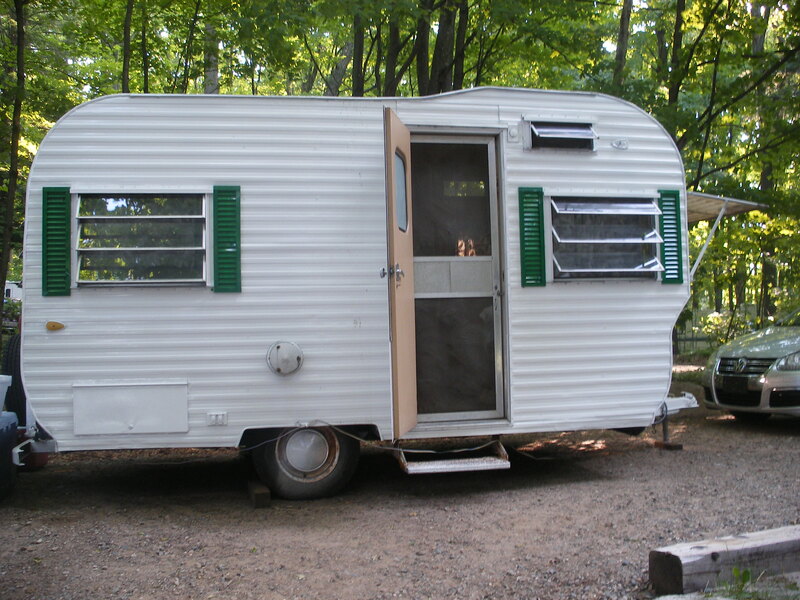 We were mighty grateful for the camper when we got back to the site. Our firepit was full of water, and there were a couple inches of water standing on the ground over most of the site. If we’d had a tent, we’d have been screwed. We changed into dry clothes, and waited it out. It stopped raining, and Matt decided to throw a line in the lake. Earlier in the trip the dogs had knocked my sandals into the fire, leaving me with only my hunting boots or my leather boots. I opted not to go. After about 20 minutes, Matt shut off the generator on me and said “I’m vetoing you. Come down here”. He’d had a pretty decent bite. We pushed the canoe out for some post-storm fishing. 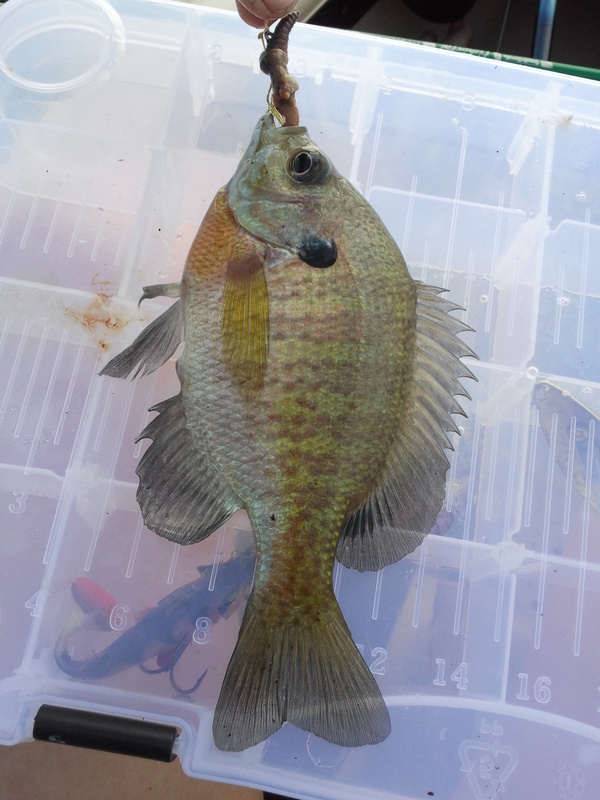 I caught a tiny blue gill, which we used for bait. And Matt finally caught a pike. But the best thing was the light at sunset. Out from under the canopy, everything was bathed in this golden light. Which turned to pink-gold, with these mammarus clouds. The water was like glass, except for the emergent weeds. Thursday morning, we headed out one more time to fish. 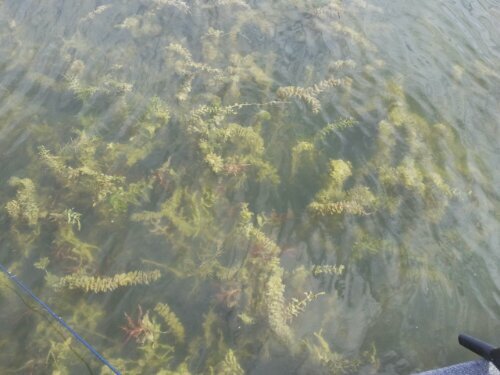 In the pictures above, we kept 32 of the fish we caught. 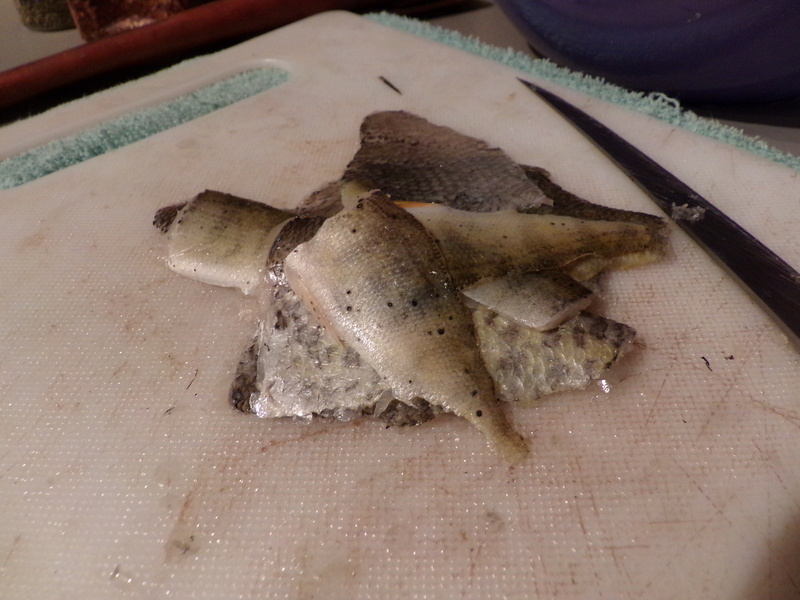 We tossed at least that many back, and used some of the really small ‘gills for bait (only in the lakes we caught them in). Once the morning bite stopped around 8:30, we packed everything in, and headed back home. Three hours later, we re entered civilization and our normal lives. I work all weekend. Matt works all of today (Friday). Next month he takes over the Madison recruiting office (for the next couple years), and I have the rest of the season to finish out at the golf course (who knows how long the weather will hold). By January, I hope to be back in college classes so I can maybe get this godforsaken degree of mine an inch closer to done. This vacation was, I think, just a pause or a breath before we both enter a bit of a new chapter. Dealing with recruiting duty with Matt just a canvassing recruiter for the last three years was incredibly hard. The first several months of him running the office will be tough as well, particularly since he’s starting right when school does. It will be a different kind of hard. I’ll be paying down the last of what I owe UW-Madison from two years ago (yuck, I know), and saving up to pay for next spring. Our one touchstone through all of this mess will be our outdoors hobbies. Hunting, fishing, all of it. It keeps us grounded, and it keeps us together. So, after busting part of the engine on the riverbottom a couple days ago, we’ve fixed the shear pin and been out a couple more times. We trolled for muskie and pike yesterday (Wednesday- I’m writing this Thursday night). 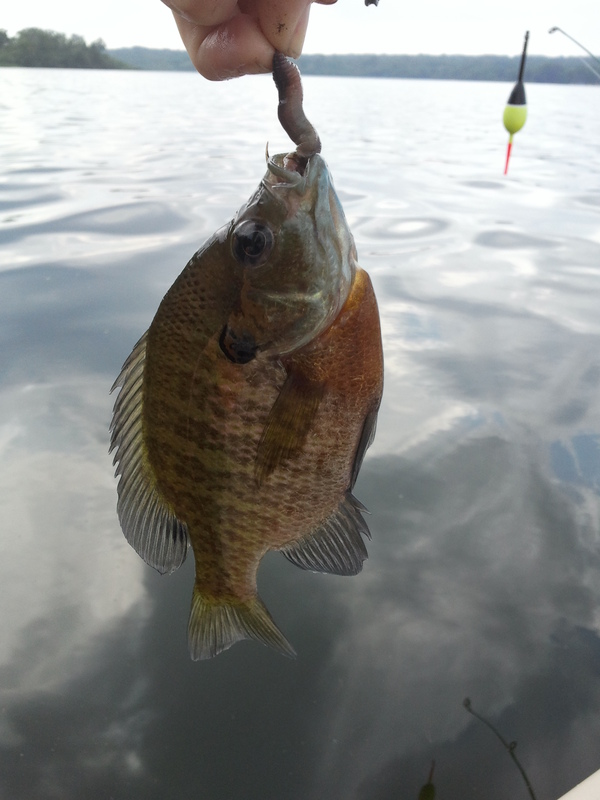 I caught the little bluegill you see above while waiting for Matt to untangle the trolling lines. 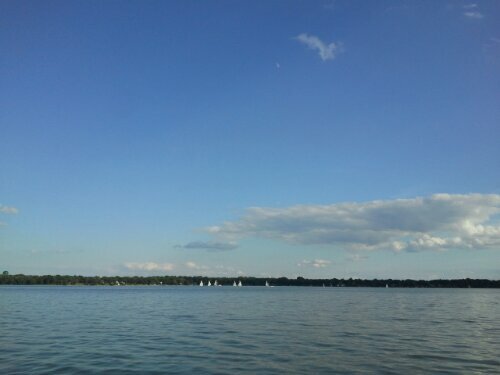 It was a gorgeous day out on the water, even though we didn’t get any big fish. 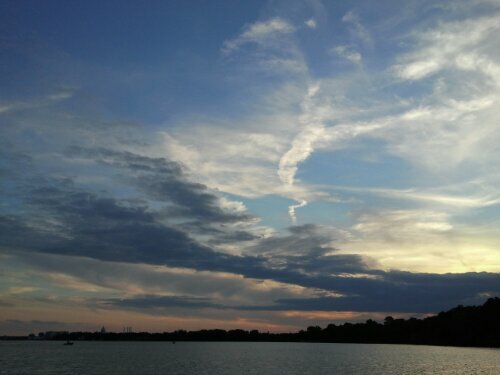 Lot of sailboats out, and the sunset was lovely. We deliberated Wednesday night about where to try next. 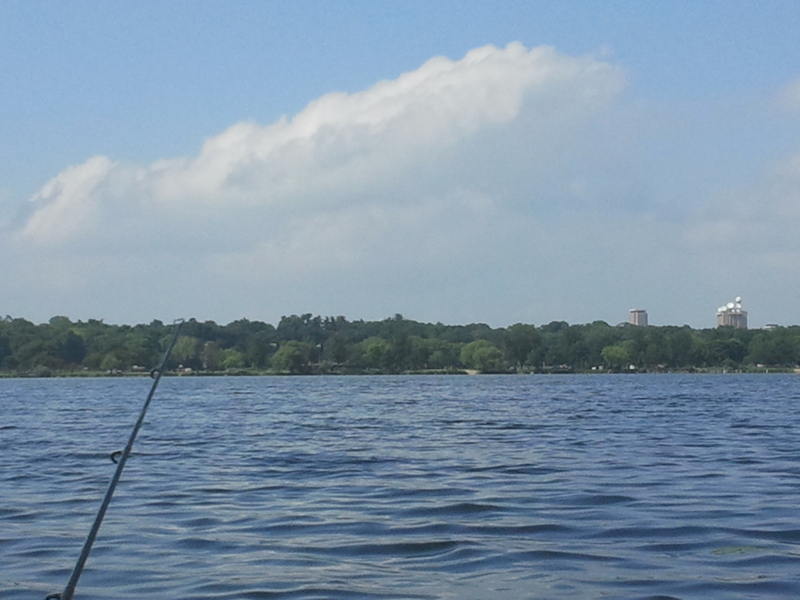 Monona is an A1 muskie lake- not a lot of them, but the ones in there are trophy sized. 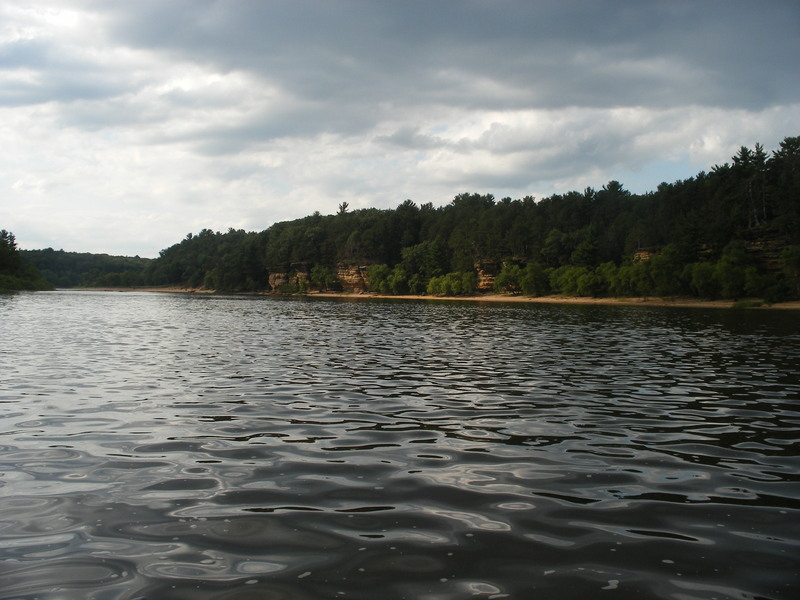 Lake Wingra is A-2- smaller, but more numerous. I voted for Wingra, since we’d never been. We drove through town to the launch off Monroe street. It was another gorgeous day. 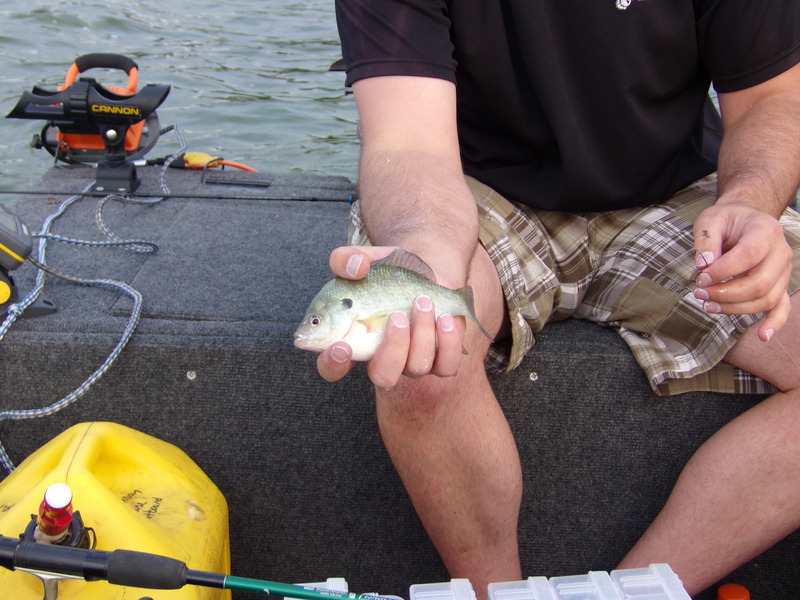 We started on the west end of this weedy little lake, and were on panfish almost immediately. Your blogger has looked better. Most of the lake was like this. We had a good variety of fish. Umpteen bluegill for each of us. 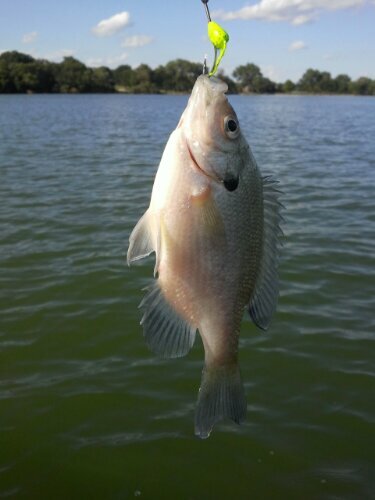 I had a black crappie and Matt had a little perch and a bass. None of the muskie we were after, but it was still a lot of fun. We headed home to run a couple errands and begin packing for this camping trip. 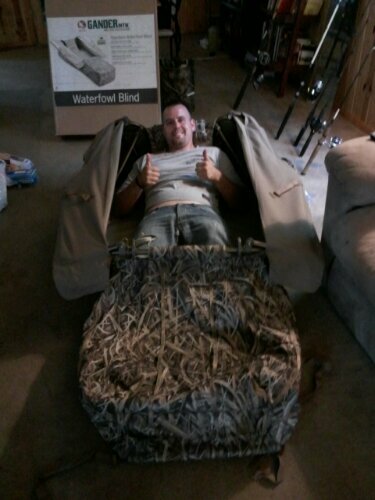 Matt got himself a lay out blind for goose. Naturally that included a trip to Gander. I don’t want to talk about how much Matt spent there, but it was good to get one of the layout blinds out of the way, at least. 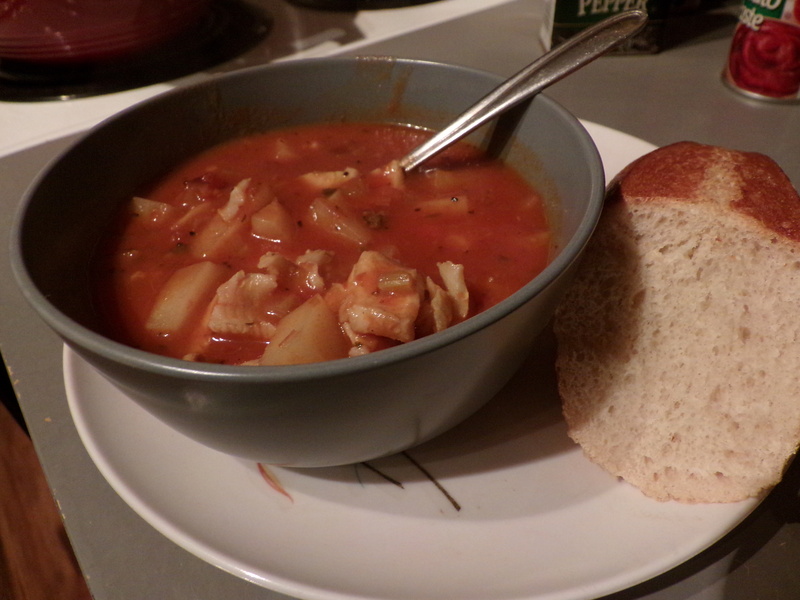 Then we came home, and I began a cooking and baking bonanza. We have a large batch of chocolate chip cookies, a plum cake, a double batch of pancake batter, two pasta salads, a container of cooked couscous, prepped dry oatmeal, and a couple different snacks and sides. We’re stopping over by Matt’s brother in Appleton first. He has a buddy who can take us out salmon fishing (!) Saturday. I drew up a big grocery list to get us to next Thursday, and we’re going to get everything up in Appleton or Green Bay to save us a few days of keeping everything on ice. So, depending on when we have access to internet/electricity, it could be a week or so until I put up anything else. Or maybe not! If I find some wifi or whatever. Every three months or so, Matt has to go away to All Hands training. Since the recruiters are generally pretty isolated out here, away from the Fleet and all the reasons people typically join the Marine Corps, it’s a combination of training updates, and a morale-boosting activity for two days. They do it in different cities all over Wisconsin, and the activities are always different, but August’s All Hands is always Family Day. Other branches and other stations do it all kinds of different ways, but here, we get cheap passes up to Wisconsin Dells. It was my first day off in seven days. We spent the better part of yesterday at the Mt Olympus theme park up there, riding waterslides, roller coasters, and go carts. We also took the boat up with us. When it got to be about 4 o’clock, we said goodbye to some of the work buddies Matt rarely gets to see, and ducked out of the park. First stop was locating a bait shop among all the lake houses up there. Once that was finished, we found ourselves a boat launch and got on our way. 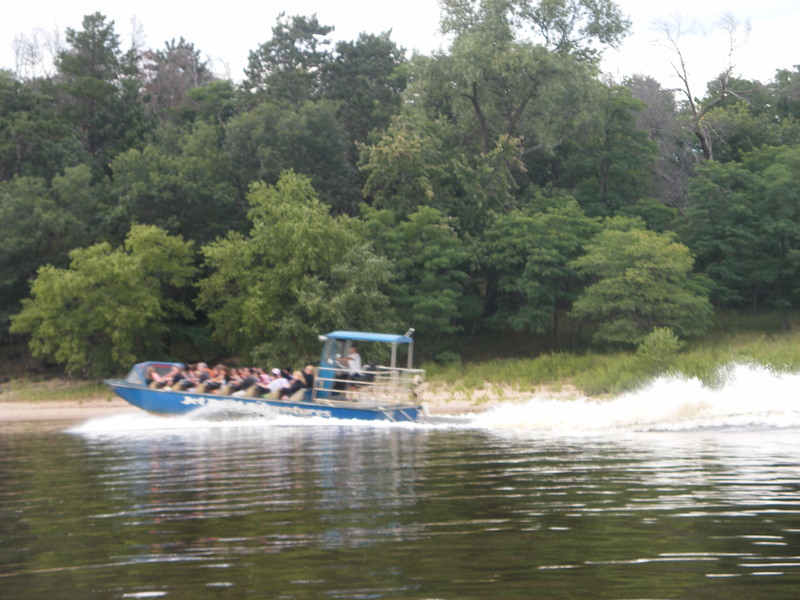 The thing about the Wisconsin River up in the Dells, though, is that it’s a major tourist attraction. 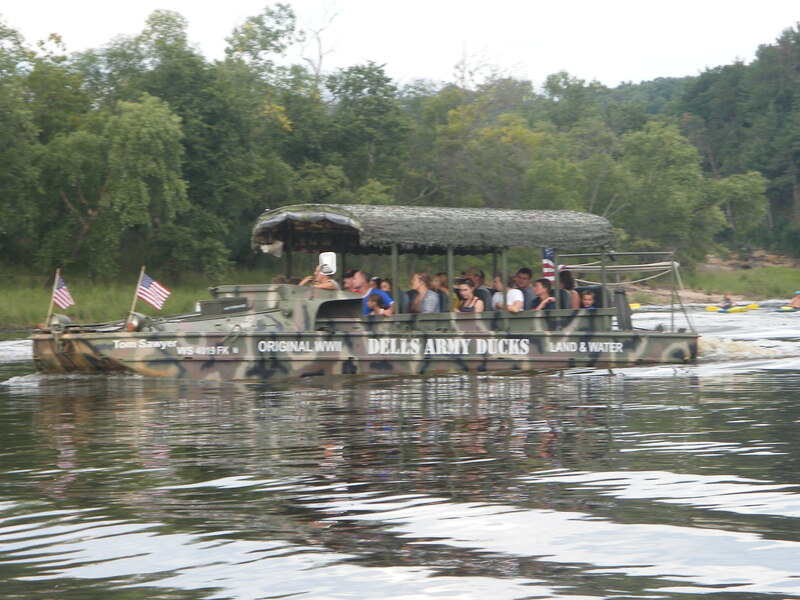 The Dells are there because of the beautiful sandstone formations, and the famous Wisconsin Army Ducks were out in force. At one point, a Duck Driver even worked us into his tour, joking that he saw the same man out yesterday with a different woman. We also had to contend with the Jet Boats. 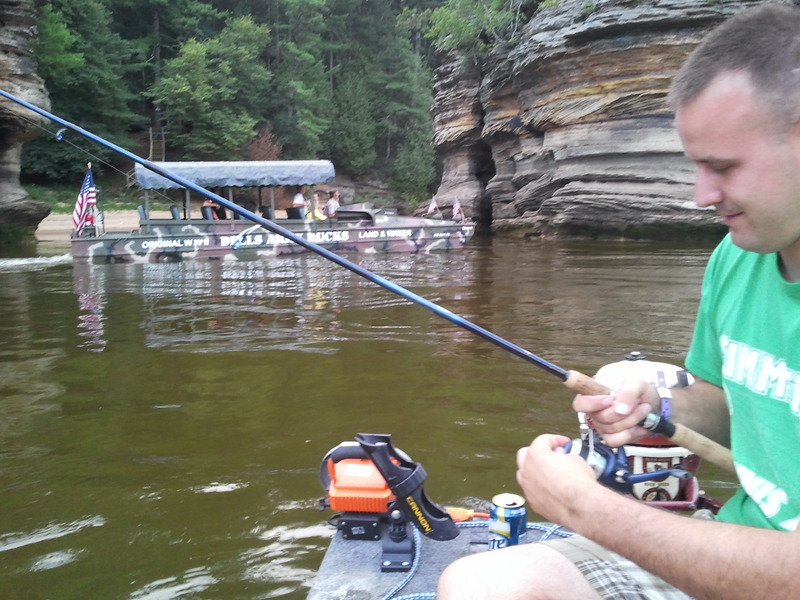 While I was reeling in that fish, one of the recruiters Matt knows from another city in Wisconsin called him. He and his wife wanted to fish with us. 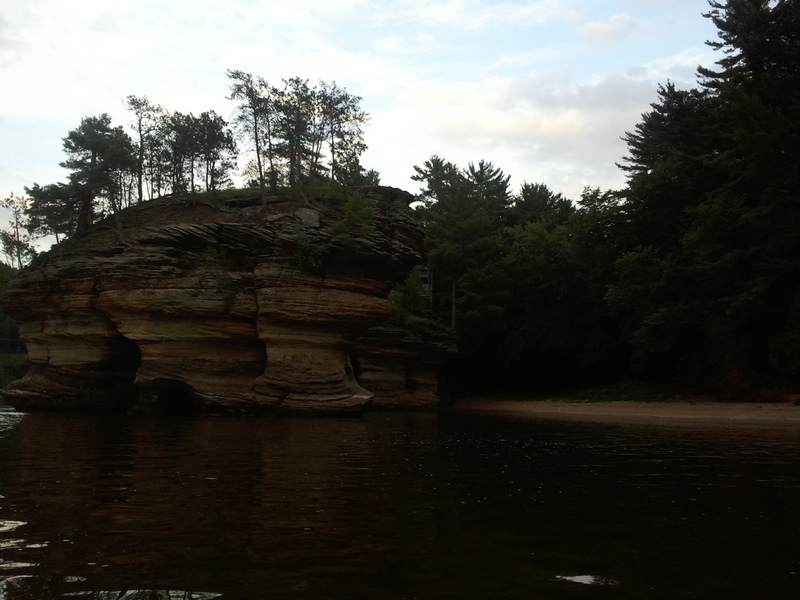 So, we puttered back to the launch, picked them up, and went downstream, fishing near this neat island. I didn’t futz with my light settings, and I should have. There were small fish jumping everywhere here. Nothing really bit, until about 30 minutes in, another Duck Tour came by. The driver went straight over one of Matt’s lines. He hooked into the Duck boat by accident. 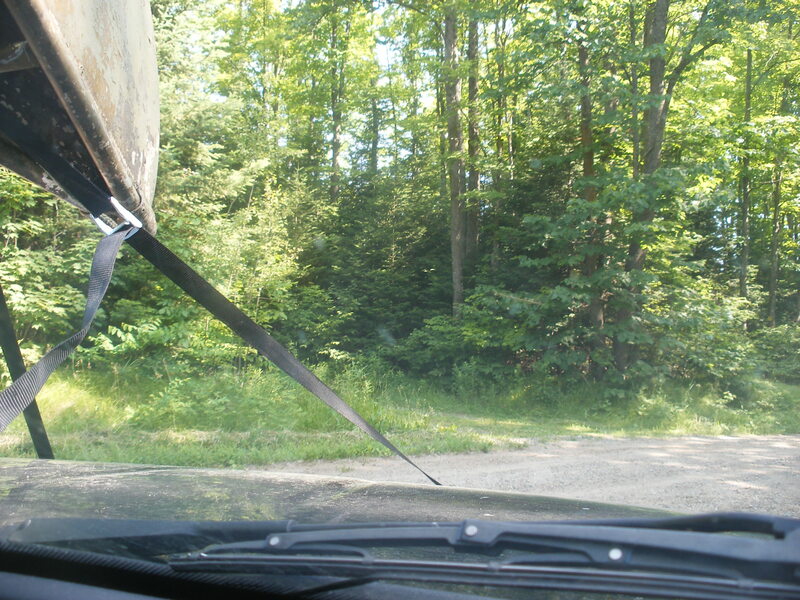 Luckily, the driver had slowed down to ask how our fishing was. We were able to shout over that we’d caught his boat, he turned around and came close to give us some slack. After that incident, we motored back upstream to that sandbar. We fished there until dark with few mishaps. Matt caught a big sheephead carp, and kept it, intending to practice his taxidermy on it. With the small school of bluegills he’s collected, the carp, and goodness only know what else he’ll keep to practice on, we’ll have a nice little starter seascape of taxidermied fish. 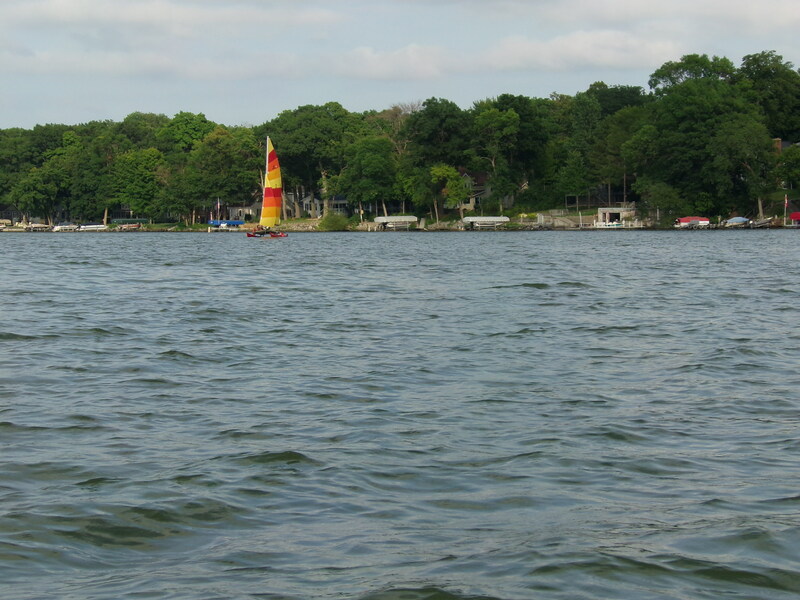 I had fun on the water. The Wisconsin is a nice river, though my only experience on it was an overnight kayaking trip two years ago on a much lower portion of it, below the Sauk City dam. It’s much deeper up in the Dells, even below the dam there. Our fish finder was reading 40 feet in the channel, and there was a hole under one of those bluffs registering 60 feet deep. We didn’t get a big flathead catfish like Matt hoped for, but we caught more fish than we ever do in the Madison Chain. I was a bit short on time this morning to finish that post. However, the rest of the weekend went pretty well. When I woke up, I took my camera to get a look around at the spot. In the brief phone call I had with Matt, he said he got the best spot there. He wasn’t wrong. She towed beautifully, he said. 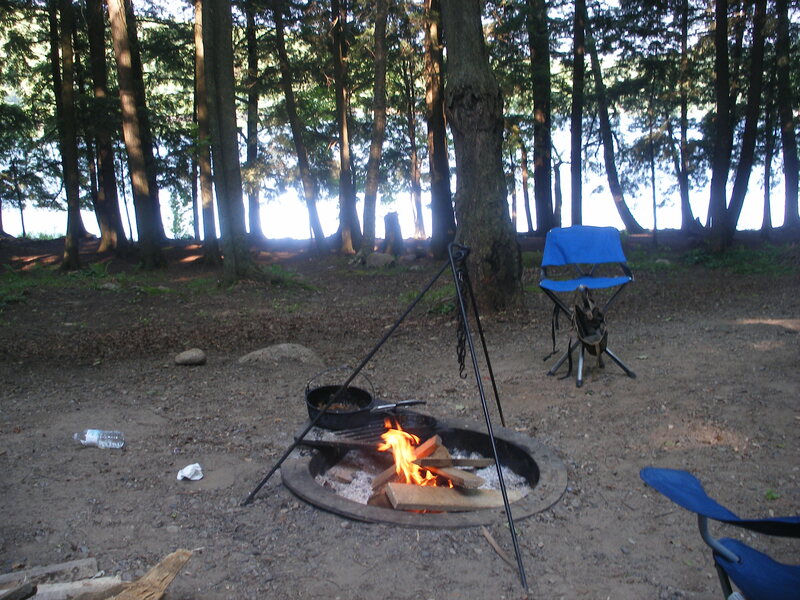 Fire pit, and the glow of sunlight on the lake. The dogs were super excited for a morning swim. Ada Lake, 50 feet from our site. 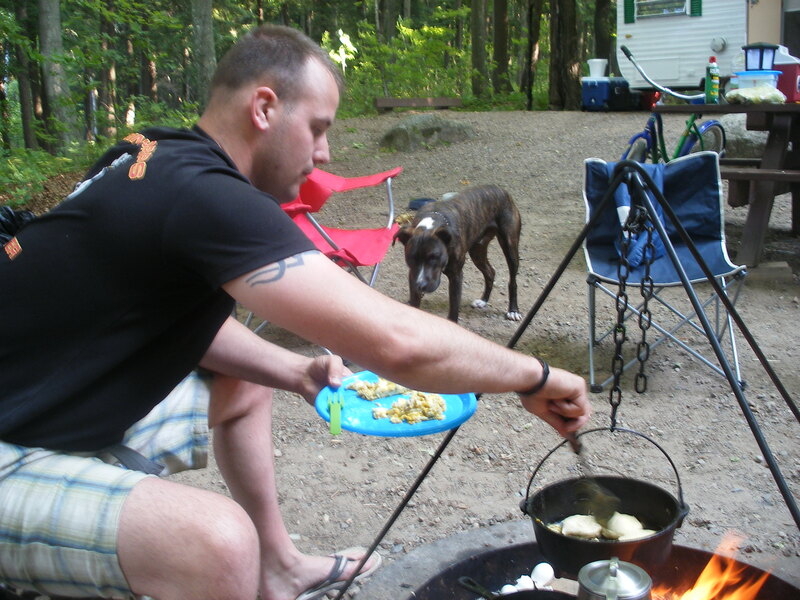 The only time Matt cooks for me is camp breakfast. We fished most of the day on Saturday. 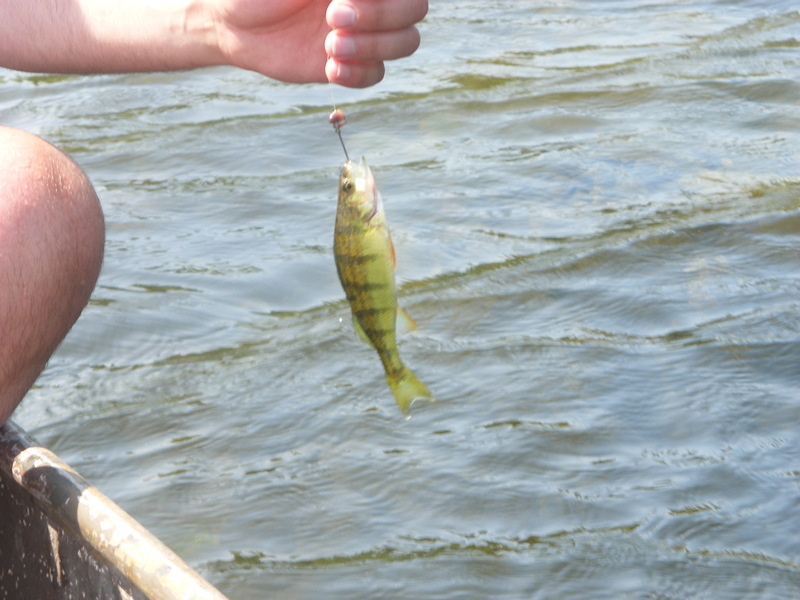 In the morning, Matt took me to the lake behind the house he grew up in, and we caught a lot of bluegills, a couple perch, some tiny baby bass, and some green bluegills. We would barely get our bobbers in the water before a little ‘gill was running with it. The only ones we kept were ones that died on the hook. I got very badly sunburned on my legs. It’s still swollen. 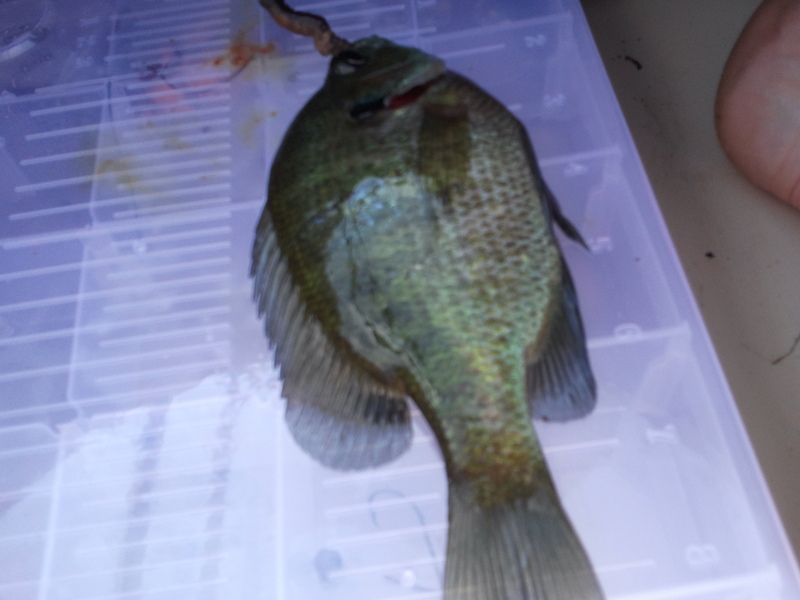 A bad angle on the first green bluegill. As the day got warmer, the bite died down. We packed up and headed out. We dropped off the fish we kept at his dad’s house, chatted with his grandpa a bit, and went back to camp. 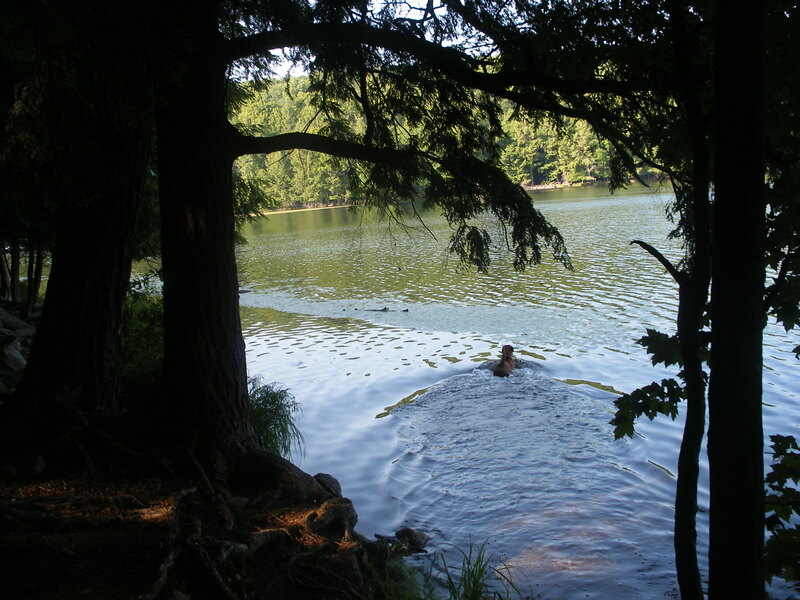 After lunch, a swim in the cold spring water of the lake, and a nap, we were ready for more fishing. At that point, I was beyond frustrated with my camera’s read error when I tried to make room on the memory card. It needs to be replaced very badly. No photos of the evening fishing, sadly. 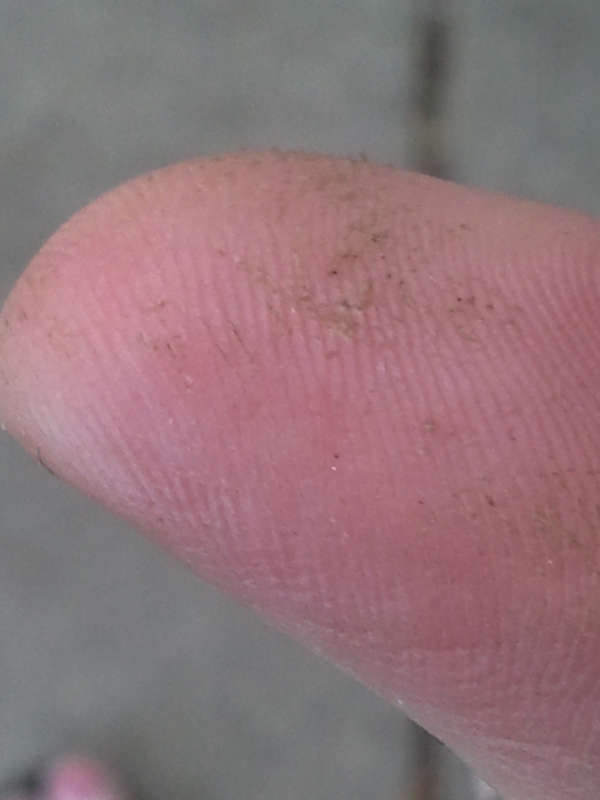 It was lots more little tiny ‘gills. 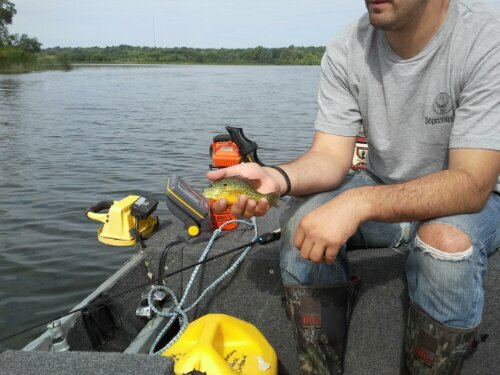 Matt managed to reel in three good sized bluegills, though. He kept them to attempt to taxidermy them himself. I imagine that will be another series all its own. On my last cast of the night, I hooked into a nice largemouth. It was 12 inches, which isn’t too shabby. The limit up north is 18 inches, though. Back in the water it went. 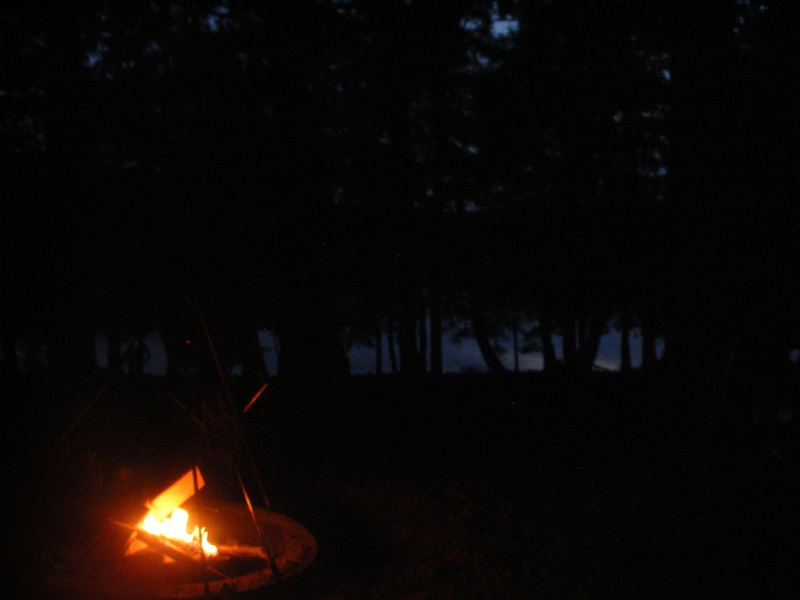 The glow of both campfire and last light. 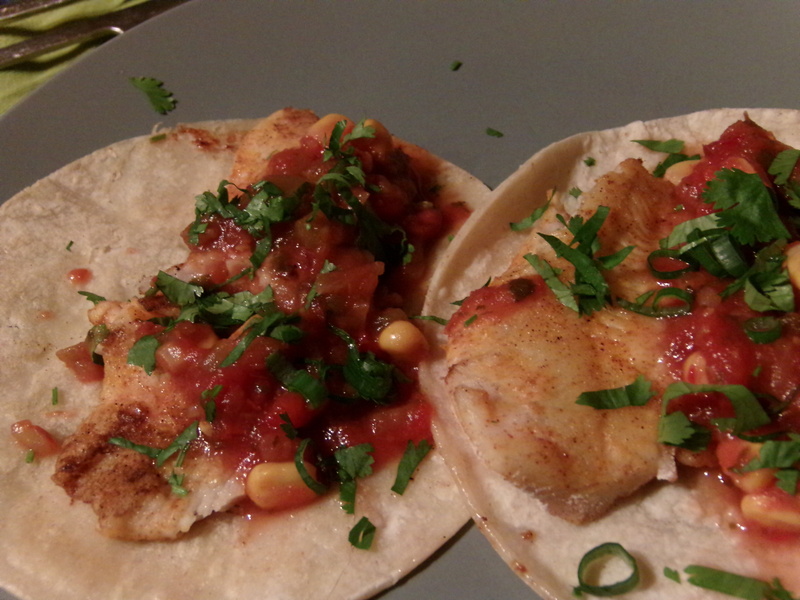 We paddled back from the fishing spot, and made our dinner. Matt’s family stopped by to chat, as we were leaving early in the morning. Matt had to be back by 11:30. We chatted and hashed out some ideas for a trip to replace the one we were originally taking to Texas. So far, the one sticking out is to head up to Door County and play on Lake Michigan or the Apostle Islands on Lake Superior. Possibly hire a salmon charter. It would be in August or September. Anyhow, we woke up around 6 to pack up camp, hitch the camper up, and hit the road. We left with no major issues- I just separated from Matt to drop off the cell phone charger and thank you to the clerk at that gas station. Even with that and a second pitstop farther south, I rolled in maybe 10 minutes behind Matt. He went off to work for a bit, and I unpacked the camper. Being able to leave so much stuff in it makes the whole process so much easier. By now, the laundry and dishes from the trip are done, and all the dirt is swept out of it. But I’m ready to go again.